Diet is a four-letter word and not a nice one at that. Diets are part of what got me into the mess I was in when I weighed 430 pounds. Part of the problem with a diet is i had been been programmed to believe I could eradicate a lifetime problem of losing and regaining weight by going on a “diet” for a short period of time, and then going back to the way I’d grown accustomed to eating. Left, Teresa Shields Parker in 2004. 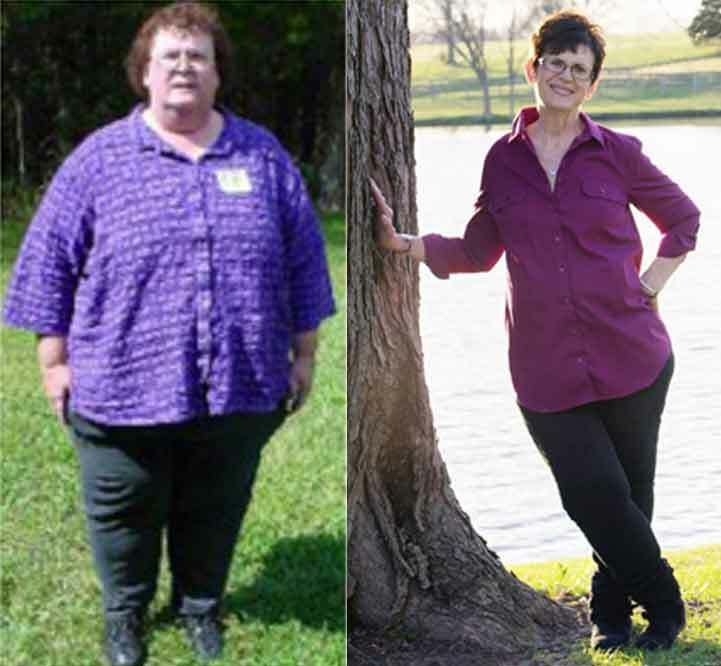 RIght, Teresa today, 260 pounds lighter. This is a lie straight from the pit of hell. I’m really sorry to say that because I, more than anyone else, wish it was true that I could just lose weight and go back to Grandma’s oatmeal cake. A diet is a short-term fix to a long-term problem. Still I prayed for an easy answer to my monumental problem. There must be a new pill or diet or magic shake which would remove the weight. Something so I could have my cake (weight loss) and eat it too (the literal cake). Even weight loss surgery did not fix me. After a while, I found a way to eat sugar. That stopped when I reached the turn-around point, the time when I made the commitment to lay down my addiction to food a day at a time. People say, “Once an addict, always an addict.” This is true to some extent. I can never proclaim that I have beaten my food addiction. I can only say, I now have tools God gave me to work on my addiction. It is a lot easier now than it was five years ago, because I have changed my habits. I’m rarely tempted and if I am, I know how to get through it hanging on to Jesus every moment. I more readily recognize those moments of temptation and am reminded, I never want to go back to where I was. That picture of me when I weighed 430 pounds wasn’t a coached picture. No one told me look unhappy. They were actually telling me to smile. In my pictures today, no one has to tell me to smile, either. Joy flows naturally when I don’t have to lug 260 extra pounds around with me. Getting rid of the physical pounds, as well as the emotional baggage, is such a relief. It’s another of a long list of reasons I am opening #KickWeight, a lower price point Christian weight loss coaching class. I want you to experience that same thing. #KickWeight is not a diet program, however we will talk about food. I’ll tell you how I eat, since everyone seems to be interested in that. Right now, eating is the furthest thing from my mind. However, tapping into what God has next for me is always on my mind. Food is simply the fuel to get me there, not the entertainment along the way. That mindset shift is a major one for me. Information alone, though, is not enough. We have way too much information already. What is needed is to have mentor who knows what you’re going through, someone who’s lost weight with God’s help. That’s where I step in. I will be so bold as to say it’s actually my calling. Without your involvement, though, no change will happen. It will take your dedication and hard work. You have to want to get healthy. It has to be #1 on your list and you must realize it is #1 on God’s list for you. You cannot accomplish the things He’s put you here on earth to do if you aren’t healthy. God always gives us a choice. He never forces us. He simply gives us a multiple choice test and then, tells us the answer. I opened #KickWeight just for you. This is the first time I’m offering a coaching class at this extremely low, rock bottom price point. 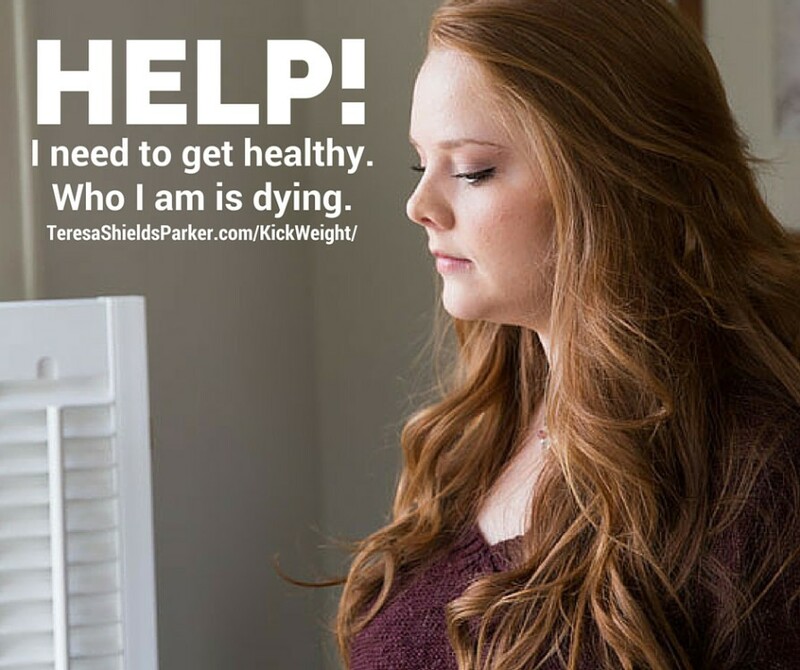 #KickWeight is a combination of information and coaching. It is exactly what I needed when I was super, morbidly obese. That’s why I know it’s what you need as well. To find out more and reserve your spot in the group, click HERE. Help! I Need To Get Healthy!